Skin cancer is the most common form of cancer in America, accounting for roughly half of all cancers diagnosed. Of the 3.5 million skin cancer cases that are diagnosed each year, the most serious is melanoma, which is expected to account for 76,000 cases this year alone. If you’ve ever been severely sunburnt, spent time in a tanning bed, or spent a lot of time under the sun without applying sunscreen, you’ve put yourself at risk for skin cancer. And although many of us can make small adjustments to avoid the sun’s rays, like limiting exposure between 10:00 a.m. and 4:00 p.m. and staying covered up, it’s not as easy if your job requires you to be outside. Farmers, public servants, landscapers, construction workers, and all kinds of other workers fill a job that requires them to be outdoors and in the sun all day, every day—or at least while they’re working. I remember when my dad had his roof repaired a few years ago. I stopped by his home to see him and noticed that none of the workers were wearing t-shirts. They were up there on the roof all day with their bare backs and chests exposed to the blazing-hot sun. And judging by their dark tans, I think it’s safe to say they went shirtless most days. 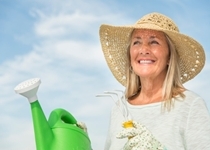 If you work outdoors, there are some essential steps you should take to protect yourself from the danger of the sun’s rays—especially midday, when the sun’s really beating down on you. And remember that even in the cooler months, sun safety is still required. The first step is to apply SPF 30 or SPF 45 sunscreen, especially on exposed skin. This blocks the dangerous rays and offers protection. I’d recommend a “sport” formulation that is sweat-resistant. Be sure to reapply it often, aiming for every two hours; once in the morning, even if the SPF is high, is never enough if you work outside all day. And if you’re wearing light clothing, it’s best to apply sunscreen even to covered skin as UV rays can penetrate through certain fabrics. Wearing a hat with a large brim is also a great decision. Baseball hats offer some protection, but hats with brims that go all the way around and come out a little farther do a better job at protecting the nose, cheeks, ears, lips, and neck from sun exposure. These little areas are all very often forgotten, so making a habit of wearing a large-brimmed hat can help keep you covered. Of course, staying covered up is also extremely important, so wearing long-sleeved, collared shirts and long pants is also recommended. You’ll likely get hot, so it’s important to keep hydrated; wear light colors and seek shade when you can. Elect to buy lightweight, breathable clothing or talk to your employer about uniform options. If they require you to be outside all day, they should supply you with the equipment you need. In this case, proper shielding from the sun is required safety equipment for your line of work. In fact, a recent study by the University of Queensland in Australia found that when leaders in a company promoted and instituted sun safety measures, employees were happy to follow them. The study also uncovered that more than half of outdoor workers rank skin cancer and sun ray/UV exposure as their primary concern. If possible, limit your sun exposure between the hours of 10:00 a.m. and 4:00 p.m.
Seattle Cancer Care Alliance, “Looks really can kill you: Protect yourself against skin cancer,” ScienceDaily web site, May 1, 2014; http://www.sciencedaily.com/releases/2014/05/140501100924.htm, last accessed October 17, 2014. Queensland University of Technology, “Helping outdoor workers reduce skin cancer risk,” ScienceDaily web site, October 14, 2014; http://www.sciencedaily.com/releases/2014/10/141014130446.htm. “Skin Cancer Facts,” American Cancer Society web site, March 19, 2014; http://www.cancer.org/cancer/cancercauses/sunanduvexposure/skin-cancer-facts, last accessed October 17, 2014.